Last week we had a pretty powerful winter storm come sweeping through Arizona just in time for New Years. There were even reports of snow here in the Phoenix area, although the weather gurus said that most of it was sleet or tiny hail. Whatever. Anyway, about 90 minutes and 4000 feet in altitude away, there was quite a bit of snow in Prescott. I had to work over the weekend, and didn’t get a chance to go check it out until today. I finished my “work” work about 2:00PM, and then we figured we still had about three good hours of daylight left so we packed the camera gear and some gloves in the car and headed north. When we left Phoenix the skies were partly cloudy, but it was obvious that it was becoming more overcast as the day went on. And sure enough, by the time we reached Prescott about 3:30, the skies were completely cloudy. That didn’t stop us from trying to get some interesting photos, however. Our first stop was at the Yavapai County courthouse in downtown Prescott. We parked the car on the square and then had a great time walking around in the snow with all the other tourists who had probably driven up from the Valley. I didn’t bother getting the tripod out because there was still a lot of ice in places, and I was doing good to keep myself upright without having my hands full. I shot everything hand-held, including some bracketed series that I intended to use for HDR’s, relying on Photomatix to line up the shots. Even though I had the VR turned on, I was shivering enough that it was hard to keep the camera steady, so I really hope Photomatix comes through for me. We didn’t get home until 8PM, and I have to go back to work tomorrow, so I only processed one shot tonight, just to get a feel for what I got. I’ll be sharing more shots later this week, including some that we took in the Prescott National Forest that are pretty cool. Here’s a shot of one of the sculptures on the lawn of the courthouse. It was tough to get a good exposure reading with the dark bronze sculpture against the white snow and the overcast sky. I think that’s where HDR really shines. I took a bracketed series so that I was able to capture the detail of the sculpture in one exposure, but get the detail of the snow in another, and then combine them so that it’s all visible. Then I couldn’t resist applying a little Topaz treatment to really make the colors pop (it was such a drab day, why not liven things up a little? ), and I really liked the results. Hope you do too! Be sure to view it large!! 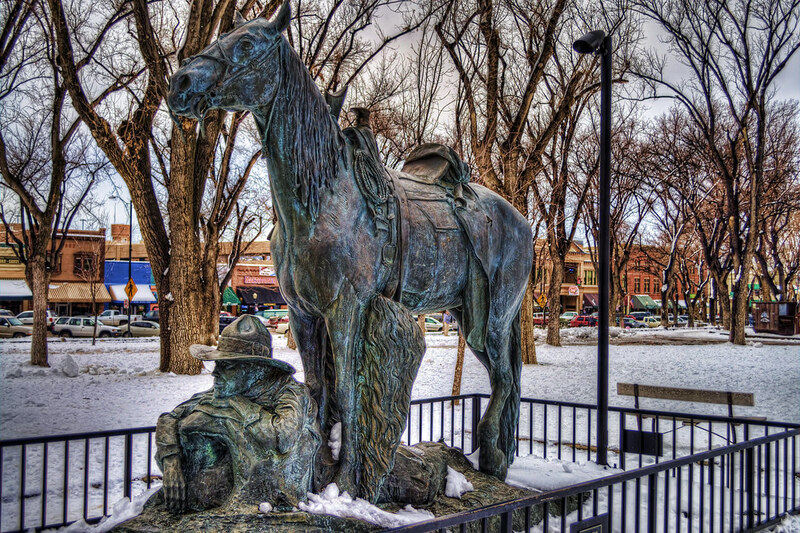 This entry was posted in Processing, Shooting and tagged Arizona, AZ, camera, courthouse, D5000, HDR, Nikon, Paint Shop Pro, photography, Photomatix, Prescott, sculpture, snow, software, Topaz, tripod, winter, Yavapai County. Bookmark the permalink. ← Getting Back in the Groove!